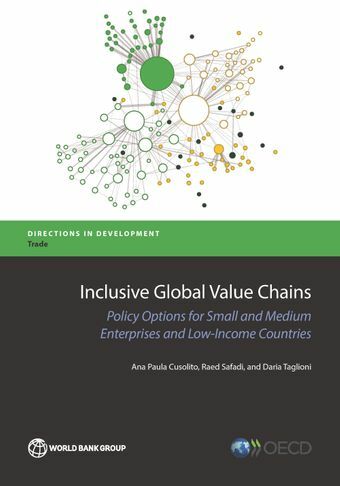 This joint OECD and World Bank Group report, presented to G20 Trade Ministers in October 2015, focuses on the challenge of making GVCs more “inclusive” by overcoming participation constraints for SMEs and facilitating access for LIDCs. Results suggest that SME participation in GVCs is mostly taking place through indirect contribution to exports (rather than through direct exports), and that a holistic approach to trade, investment and national and multilateral policy action is needed to create more inclusive GVCs.The report highlights the importance of ensuring access to ICT networks – in particular broadband – and stimulating innovation – in particular by enhancing the ability of SMEs to manage and protect their intellectual assets. At the same, the report underscores the importance of helping small firms scale up quickly, and to better integrate in GVCs by lowering barriers to the entry, growth and exit of firms. Countries should also avoid favouring incumbents over new firms.